Growers prefer plywood harvest bins because they are a long-lasting, cost effective solution. Diamond Fruit Growers, Inc. in Hood River, Ore. turned to plywood in 1959 to replace the outdated slatted lumber bins, common in the 1950s and 60s. 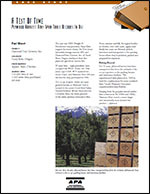 Like many growers, Diamond Fruit picked plywood for a number of reasons. It’s easier to handle, quicker to repair, simpler and safer to transport, gentler on produce and holds up under years of use. Diamond Fruit has some bins that have been in service for more than 30 years. Due to their strength, plywood bins permit rougher handling and better stacking ability, and the thin walls allow them to hold more produce than thicker-walled plastic bins. Unlike non-wood bins, plywood bin designs are easy to modify. Refinements such as slots for cooling stored produce or draining water from the bins are easy to incorporate. Four basic factors dictate pallet bin dimensions: size, shape and weight of commodity; plant storage facilities; materials handling equipment; and the mode of bin transportation. Dimensions of a pallet bin are normally given as length, width and height, respectively. The width refers to the side with the fork openings. Usually, the dimensions are given in inches; however, some users still describe a bin by the approximate load size in feet. For example, a 4x4x2 foot bin may be only 47x47 inches and have a load depth of 24 inches. If bins will be stacked, the plant ceiling height may limit bin depth to obtain optimum use of storage space. Large bins require consideration of doorway size, aisle width and other obstacles. Generally, any plant area accessible to materials handling equipment can accommodate average-sized pallet bins. In some specialized operations, pallet bins transport a number of smaller cartons. In such situations the size and number of cartons directly influence the size of the pallet bins. If pallet bins will be shipped between plants, or from manufacturer to user, the type and capacity of truck or railroad car should be considered in determining size. In agriculture, where flatbed trucking is common, the 8-foot wide load limit accommodates the standard 47-inch bin. Two unit loads arranged side-by-side on a truck bed leave just enough room for load binding. The type of equipment used in materials handling operations has a profound influence on pallet bin design. The bin base or pallet, commonly called the deck, should be designed to facilitate the various types of handling equipment used in-plant, as well as those used for transportation to outside destinations. While in no way an exhaustive list, several common pallet bin types are described below. Two-way entry and full four-way entry pallet bins, manufactured with 4-inch (nominal) high stringers or blocks, permit access with lift truck forks and hand pallet truck outriggers. Lift trucks have four-side access to partial four-way entry (notched stringer) pallet bins, while hand pallet trucks can gain entry from only two sides. A specialized system uses hydraulically actuated clamps that lift bins by their top edge. Bins used with this so-called "lightning loader" require an external top rail or rib for the clamp fingers to grip in lifting. Current standards limit the overall width of the bin so there is some decrease in material volume, per bin, with this type of top-handling system. Plywood and OSB containers are available in a variety of sizes and configurations. Collapsible bins, bins with plastic liners for liquids, bag-in-a-box crates, containers with built-in pallets – these can ship everything from heavy machine parts to delicate agricultural products such as apples to ink, tomato sauce, and granular materials. Plywood and oriented strand board (OSB), are common materials used to make engineered wood panel containers. Specialty products such as overlaid panels and sanded plywood can also be used when an extra-smooth surface is desired. By joining wood components with simple hardware, manufacturers can match the specifications of a container or bin with the requirements of specific products and materials handling equipment. The APA family of bin designs includes a 300-gallon "Big Bin," a 100-gallon bin, a 55-gallon "Slim Bin," and a 16-gallon bin. Other bin sizes can be custom designed by a manufacturer. For more information on bins, consult the publications listed to the right. 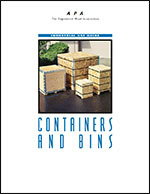 This publication covers design and specification recommendations for APA's Big Bin and Slim Bin and several proprietary containers. This case study features Diamond Fruit Growers, Inc., who has been using plywood harvest bins for 37 years to store and transport fruit.